Cuisinart Multiclad cookware is both elegant and contemporary. Cuisinart has designed this line specifically for the professional home chef. The attractive brushed exterior looks nice on the stove and on the table, while the mirror-polished interior offers a non-reactive surface that releases food easily. The aluminum base is sandwiched between stainless steel, both on the bottom and the sides, offering a quick, even heating surface. 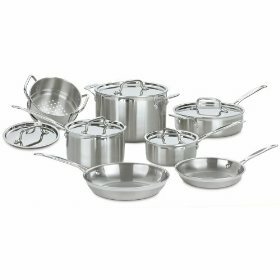 This cookware is perfect for steaming vegetables, making crepes, hamburgers or braising meats. The stockpot is perfect for soup or stew. Stainless steel browns roux perfectly for sauces. The pans switch easily from the stove to the oven when needed. They are well-balanced. The lids are interchangeable and even fit the skillets. 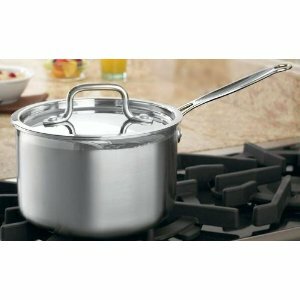 Cuisinart Multiclad pro cookware is easy to clean. Even if food sticks, it can be removed with a few easy tricks. Whats Included In The Set? How Is The Cuisinart Multiclad Made? What Is Tri-ply and Multiclad? Tri-ply is the when there is 3 layers of metal used in making the cookware. Clad is when the entire pan has 3 layers and not just the bottom. Cuisinart uses an 18/10 brushed stainless steel for the exterior and a mirror-polished stainless steel interior. In between these layers is an aluminum core. The best feature with this set is that the aluminum core is not only on the bottom but goes up the sidewalls of the pans which gives you superior heating. You will be amazed at how fast the cookware responds when heating or cooling. How Are The Handles and Lids? Features Cuisinart Cool Grip Handle, these riveted handles have a nice groove to fit your thumb and finger to make pouring easier. Plus they stay cool on the stove top. The ergonomic shape and angle of the handles are comfortable when shaking, flipping, tossing and moving the pans while cooking. The design of the rims and lids form a fit to help reduce evaporation and seal in nutrients. The lids are also interchangeable and also fit the skillets. Oven and broiler safe up to 500 degrees. Naturally the handles will get hot when using them in the oven, so make sure to use a oven mitt or glove when handling. What Utensils Can I Use? You can use all types of utensils. But metal utensils may scratch the interior of your pan. To prevent this, wood or plastic utensils should be used. Stacking or crowding your pans in cabinets can cause them to get scratched. To prevent this it is best to store your pans with a cookware rack or pegboard. The ends of the handles have a convenient loop for hanging your cookware. How Heavy is the Multiclad? Total weight of the entire set is about 25 pounds. Cuisinart Multiclad cookware can be a bit heavy until you get used to handling it. The construction of the pots and pans make them a little heavy on the bottom. This extra weight can be of an advantage as they will not tip as easily as lighter weight pans, even empty or with a large spoon hanging off one side. If you never have cooked with stainless steel there are a few things you need to know to get the full benefit out of stainless steel. First cooking on high heat will burn your food. The Multiclad pro cookware is highly conductive and heats quickly and evenly. So when starting out use the low to medium settings and see what setting does best for you. If you are just boiling water try to use the medium high setting. Preheat your pan first before adding any food to it. Also you might want to take your food out of the refrigerator and let it warm up a little before you start cooking. Pre heat the pan for a few minutes than add oil or butter before adding any food. Adding salt before liquid is boiling in a pan may cause pitting. Since this is consumer-caused, this is not covered in the warranty. When cooking on a gas range you might want to consider using a flame deflector. Does It Work On Induction Stove Tops? Cuisinart states that the Mutliclad pro cookware is safe to use on induction stove tops. Some earlier versions of the Cuisinart multiclad line did not work on induction tops. Cuisinart Multiclad pro is dishwasher-safe, but you need to remember that food soil from other dishes in the dishwasher can be abrasive and scratch your cookware. If the dishwasher is not packed right other dishes or flatware can mar the surface of the cookware. Regular dishwashing over a extended period will eventually scratch any cookware. If you do decide to use the dishwasher Cuisinart recommends using a non-lemon detergent. We found many customers that do put their Cuisinart cookware in the dishwasher with out a problem. But a few that did use the dishwasher experienced a discolor or change in the finish of the cookware. For hand washing here are a few tips to help with cleaning. Make sure to clean your pans immediately after using them. Just fill the pan with some hot water and a mild liquid detergent let this stand until the water becomes lukewarm then just use a sponge or soft dishcloth to clean it. Rinse the pan good and dry thoroughly to prevent water spotting. Bar Keepers Friend is a good cleanser to use to keep your stainless steel looking its best. Many customers compared the Multiclad cookware with All-Clad and found it to be the better cookware. Cuisinart gives you a lifetime limited warranty. This means that the cookware is warranted to be of defects in free of defects in material and workmanship under normal home use from the date of original purchase throughout the original purchasers lifetime. The pans distribute heat very evenly with no hot spots. The price is very reasonable for such high quality cookware. Many customers have compared it favorably to All-Clad. The 18/10 stainless steel is durable and looks good enough to hang in plain sight. We found the average retail price for this set to be around $300.00. At the time of writing this review Amazon had it discounted below the average retail price.